All Things Considered host Ed Ronco and producer Geoffrey Redick take listeners inside the heart and soul of Skagit county, from farmers helping each other thrive to vital programs for marginalized populations. They visit Bow Hill Blueberries, where Harley Soltes is hard at work juicing 180 pounds of thawed blueberries on his 5-acre farm. Most of the berries are frozen once they’re picked, a “value-added” approach, Soltes says. “And by freezing all the fruit first, it kind of ruptures the cell structure and helps release the juice the way we do it,” he said. The farm is one of the founding members of the Puget Sound Food Hub, a farmer-owned cooperative with the goal of selling good food at a price that will keep farmers in business. Jacqueline Moulton of our South Lake Union cafe recently spoke to KUOW Public Radio's Bill Radke for their show “The Record,” about how to help a homeless person in crisis. In addition to her work with Portage Bay Cafe, Jacqueline is the Art & Communications coordinator for Aurora Commons in Seattle. Take a listen via the link below! Atlee Feingold (right) with OYES cofounder Savannah Hense. Atlee Feingold works at Portage Bay Cafe in South Lake Union and recently sat down to tell us a bit about her music and passion project. 1. Can you tell us a bit about what you do? I am a singer/songwriter and also the co-founder of small altruistic business, Open Your Eyes Sunnies (OYES), that donates a $1 of every pair purchased to Everytown for Gun Safety. Music - I have been singing and song writing since I was very little however, it wasn't until I moved to Seattle that I really started to pursue producing and performing my own music. My music is a mix of alternative blues and new age folk. Its where my heart lies and I love it. OYES - Violence in America is not something any of us should take lightly and violence with a gun can be finite. I wanted to do something else with my time that gave back to the people who are pounding the pavement each and every day to push gun sense regulation and make our cities, schools and neighborhoods safer for all of us. 3. What inspires your work? What inspires you? Music - Life, experiences, love, self expression and honesty. Also giving people permission to feel. Thats why I do what I do. OYES - Creating a society that is based out of community and communication rather than boundaries and fear. Thats what drives me. I am inspired by all of the people whose lives have been affected by gun violence and get up every day and fight to make sure others do not suffer from the same fate, the moms who go door to door to help pass gun sense regulation, the parkland students, and all of the victims who have lost their lives and loved ones to senseless, preventable violence. They inspire me to get up every day and do this work. 4. Where can people learn more about your work? Music- Join my mailing list! OYES- Join our mailing list! 5. What is your favorite Portage Bay Cafe dish? Quiz: How Many of These Portage Bay Dishes Have You Tried? Find out how familiar you are with our menu! My current artistic endeavor is my new YouTube channel called, "Frank The Zombie." It is a vlog series where I play an out of work zombie, looking to make it big on YouTube so he can pay the rent. I have several videos up now, including a parody music video of Selena Gomez's "Hands To Myself" featuring a few other Portage Bay Cafe crew members :) But soon, Frank will be making his version of popular YouTube videos like, unboxing, reaction, and ASMR. Just to be ridiculous, and hopefully give you a laugh. I've been making short funny videos with friends ever since I was in grade school and my parents got me a Tyco VideoCam for Christmas. I wanted to reconnect with the fun of that as an adult and thought YouTube would be the perfect platform. I got into theatrical and special FX makeup at UW, and thought this project would combine all my interests: Acting, Writing, Film Making, Comedy, Horror, Special FX. What inspires your work? What inspires you? Honestly, I'll be watching something on TV, or listening to a song, and I'll start spacing out into different scenes or moments that those media conjure up in my head. Especially music, I have a very cinematic imagination. I can hear a song and think of exactly what images I would pair with it. Or riff off of a joke or comment one of my friends make, they have a LOT of great ideas!!! You can look up my YouTube channel "Frank The Zombie" LIKE AND SUBSCRIBE, haha, you can be responsible for launching Frank into stardom! 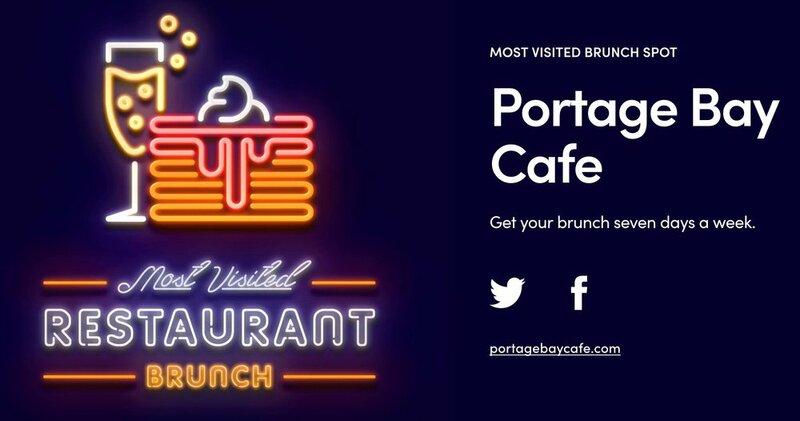 And lastly, what is your favorite Portage Bay Cafe dish? I tell everyone who will listen that I think we have the best Pancakes that I've ever tasted! But when it comes to lunch- I eat a Chicken Wrap every day! It's lovely. Quiz: What Kind of Pancake Are You? Ever curious which Portage Bay pancake best represents you? Take this quiz to find out! Test out your knowledge on the Portage Bay menu!